How can I re-send an appointment confirmation by email? 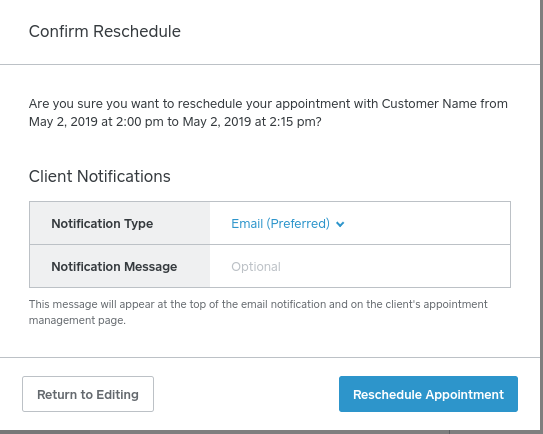 If a client books an appointment online with us, and then calls me later with an updated email address, when I correct it on my contacts/customers, will that contact automatically get a new confirmation notice to the new email address? Is there a way to manually re-send an appointment confirmation ? Re: How can I re-send an appointment confirmation by email? Hi @shardyer! I've answered your questions below. When I correct [a client's email address] on my contacts/customers will that contact automatically get a new confirmation notice to the new email address? If your client has saved their card informaiton on file with you then yes they will be notified if you change their email address. But, if a client does not have a card on file, they won't be notified if you edit their email address. Is there a way to manually re-send an appointment confirmation ? If you edit the date, time, service, or member of staff of an existing appointment and click Save you'll be prompted to send the customer an email (or SMS) to notify them of the changes (see screenshot below). However, that option won't appear if you edit the client's email address, phone number or if you add a note to an appointment. As a workaround you could ask your clients to log in to their customer account from your booking site to view the updated appointments and edited contact information from there. I agree it would be really handy to be able to resend an appointment confirmation email though for peace of mind - and I've shared your feedback with the Appointments team. Thanks, as I have had some that have asked me to re-send the confirmation and/or send a copy to someone else. Would be nice for them and me to have a "Send a copy of the confirmation to..." option to input an email address.